George and Martha Washington traditionally spent Christmas at home enjoying the festive time with friends, family, and feasting. Close friends and relatives frequently came to visit for the holiday, joining the many children, grandchildren, nieces, and nephews who were part of the Washington household over the years. 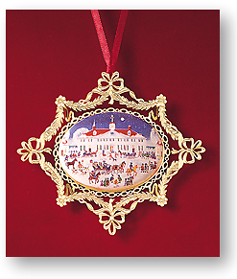 The scene on this ornament is adapted from a painting by Carol Dyer, a well-known contemporary folk artist. The 24-karat gold-finished brass border is derived from the decorative swags on a tea bowl from a porcelain tea service owned by Martha Washington.